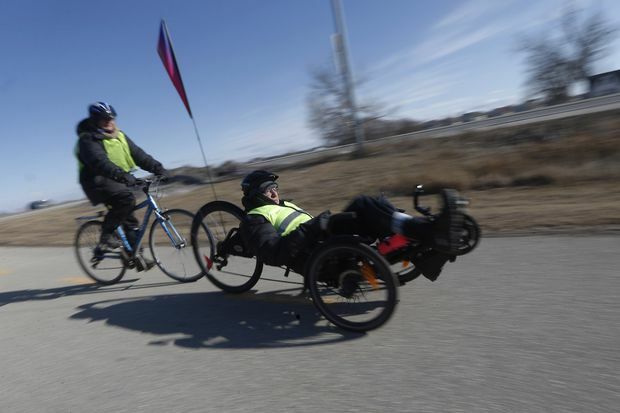 Jill Oaks and her husband, Rick Riewe, are photographed on a bike trail in Winnipeg on April 4, 2018. A Winnipeg couple planning the trip of a lifetime realized they would need some help along the way, so they put up an online advertisement looking for a very specific person — a qualified caregiver with a serious love for cycling. Jill Oakes, 66, sat down at her computer earlier this week and thought about how to best explain the job: A four-month-long bicycle trip with her 76-year-old husband Rick Riewe, a retired senior biologist with Parkinson’s disease. Oakes typed into the Kijiji ad, “Duties include: helping wife monitoring external catheter or Depends; taking care of personal hygiene and dressing; keeping a watch out for safety” and the caregiver should have experience working with seniors, a health-care aid certificate, love cycling and have experience camping. Soon, a few emails started to trickle in. “It looks like we have several people who would like to come either for a month or two, or the full four months,” Oakes said with a beaming smile. Parkinson’s is a neurodegenerative disease where the cells that produce dopamine, a chemical that carries signals between the nerves in the brain, start to die. Symptoms include tremors, stiffness, problems with balance and, as it progresses, cognitive changes. Riewe was diagnosed in 2013 and the couple were devastated to learn no medication would help, but his doctors suggested cycling could reduce symptoms. “When I found out I had Parkinson’s, I decided I better get off my backside and start exercising,” Riewe said. Cycling at a high rate of speed pushes information from the muscles Riewe is using to the brain, which triggers the release of neurotrophic factors, the couple explained. “There’s synapses between the cells and new pathways get formed. Just like when you wreck your ankle and you get new tendons sewn in from somewhere else, the brain has to tell that tendon to do something else,” Oakes said. They started biking together daily and it made a big difference. Not only was Riewe more mobile after a good ride, but his speech improved. He could chat about his time as a professor and reminisce about the years the couple spent working with the Inuit to help select lands that would eventually become Nunavut. They biked all winter and each summer they would do a longer trip, along the California coast or through British Columbia. Initially they were both on regular two-wheel bikes. But, as Riewe’s balance started to fail, he moved to a special adult tricycle. For the upcoming trip, they will be using a tandem tricycle. The past year has seen Riewe’s health decline, Oakes said. When they started planning the upcoming trip, they realized it was time to go big — this trip could be their last. Starting in Winnipeg in May, they plotted a path south along backroads to North Dakota, then to South Dakota and the Black Hills, a mountain range that stretches into Wyoming. They will cycle past Denver and then east on the TransAmerica Bicycle Trail, eventually riding up to Riewe’s brother’s house in Michigan before making their way back to Winnipeg. Family members will be joining them along the journey for a few days at a time. The couple don’t have many concerns about cycling and they know their way around the woods and camping. But with Riewe’s health, some things are becoming more challenging and packing now includes things like external catheters. “It’s not just any old caregiver. It has to be someone who is a cyclist and loves adventure, that doesn’t mind sleeping in a pop tent,” Oakes said. So far, the couple have not been able to find the right person. But, like the rest of their Parkinson’s journey, it hasn’t stopped them from getting excited for the next chapter of their adventure. “There’s a whole bunch of stuff we can’t do anymore, I don’t even go there anymore. That doesn’t help at all,” Oakes said.